Every Spring and Summer my eyes feel good, but my nose dont. 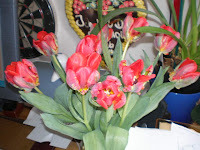 I had an allergy to the flowers during spring which lasted until Winter comes. My nose is always clogged , difficult for me to inhale. I asked some of the Filipina here if they encounter the same problem. Some of them experienced the same problem i had. In school most of us are "Auslander" foreigner so they understand me if my allergy attack me in the middle of the lesson. ( make sneeze)But still i love flowers and warm weather.